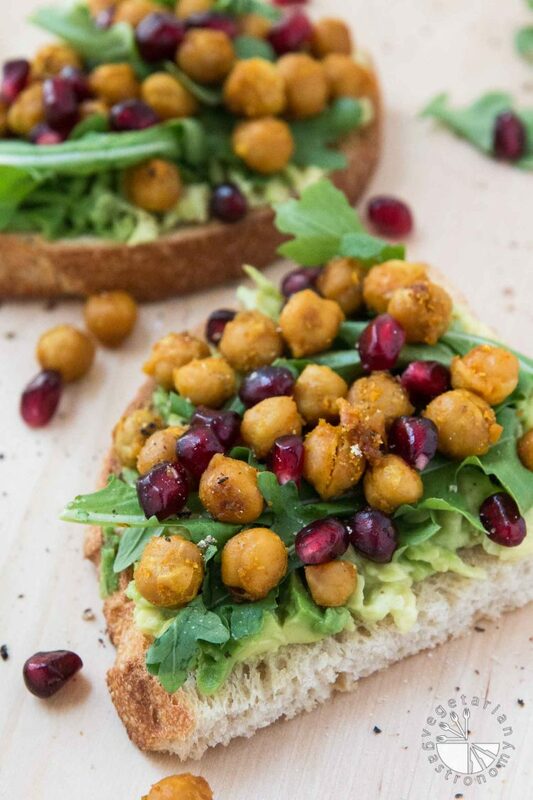 Mashed creamy avocado topped with fresh arugula, oven roasted sweet & salty chickpeas, and fresh pomegranates all loaded on your favorite toasted bread! This healthy, easy, festive avocado toast recipe is perfect to serve for the holidays! I’ve been meaning to share this recipe for the past year! It’s hands-down one of my FAVORITE avocado toast recipes. Breakfast, lunch, AND dinner…this healthy, delicious recipe can and will be enjoyed by you anytime of day once you give it a try! Or at least it happened to me the first time I made it a year ago. Well, in the midst of all the holiday madness last year, I forgot to photograph it (while stuffing my face with this loaded avocado toast recipe) and pomegranate season had already ended. Since we have more than 30 pomegranates every year, I prefer not to buy them from the store. As soon as my pomegranates came in this year, this recipe was the first thing I perfected. 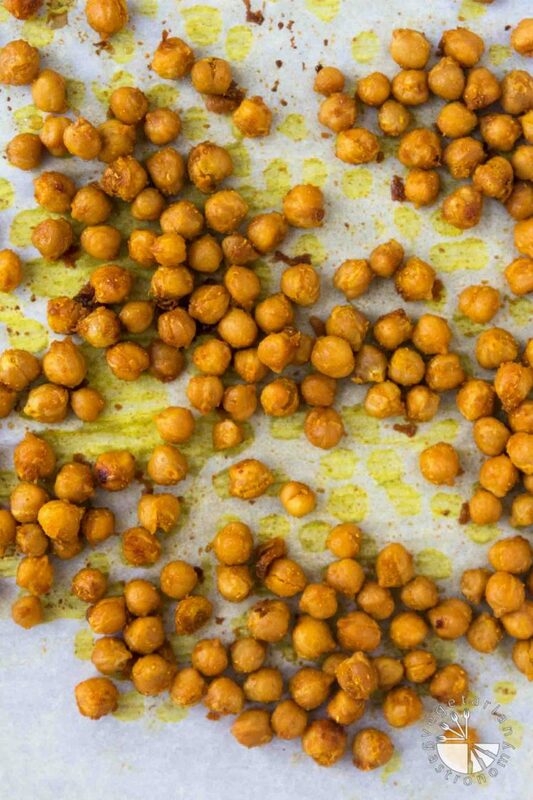 It started with the Sweet & Salty Oven Roasted Chickpeas recipe, which I shared with you a few weeks ago. Tell me you’re not salivating yet! 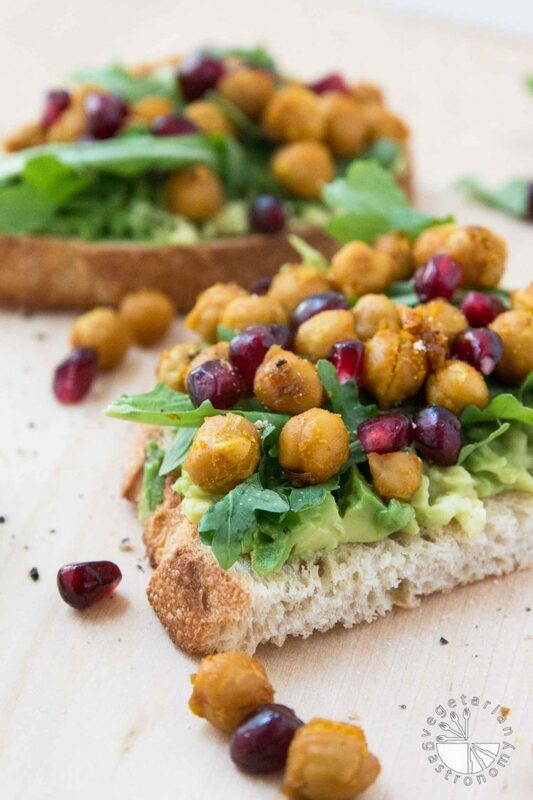 This avocado toast recipe is easy to make, especially if you prep the Sweet & Salty Oven Roasted Chickpeas ahead of time. Unlike many avocado toast recipes where you find yourself hungry shortly after, this avocado toast will leave you full and satisfied. It’s healthy and packed with nutrition and whole ingredients. Pomegranates are also beautiful and fun to use in your cooking over the holidays. 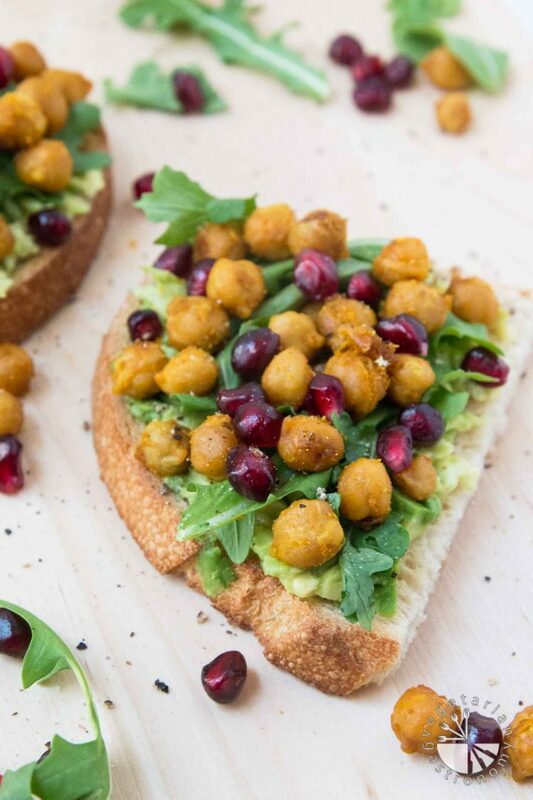 If you have visiting family and friends and need a break in between all that cooking, throw some chickpeas in the oven and serve this festive, easy, quick, yet filling Loaded Avocado Toast Recipe with Roasted Chickpeas & Pomegranates for breakfast, lunch, or even dinner! You can also cut them in half and serve them as appetizers. I would LOVE to see and share your loaded avocado toast recipes on Facebook or Instagram. So if you try out this recipe, be sure to tag me with both @vegetariangastronomy #vegetariangastronomy so I don’t miss it! Happy Holidays everyone! 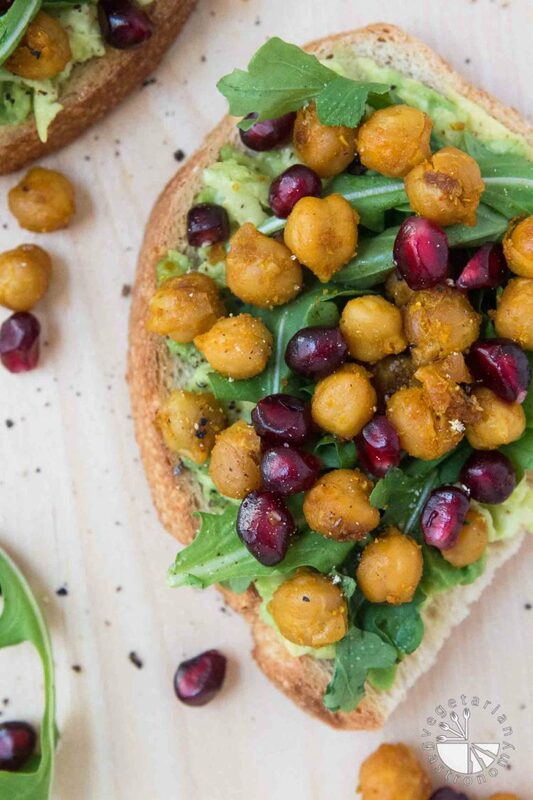 Mashed creamy avocado topped with fresh arugula, oven roasted sweet & salty chickpeas, and fresh pomegranates all loaded on your favorite toasted bread! In a medium size bowl, mash 1/2 of a ripe avocado with a fork. Season with salt and freshly ground black pepper. Toast the sourdough bread. Cut each in 1/2 before preparing. Top with a layer of mashed avocado, followed by fresh arugula leaves, Sweet & Savory Oven Roasted Chickpeas, and fresh pomegranate seeds. Repeat with the remainder of the roasted chickpeas. The exact yield depends on the size of bread used and the amount of roasted chickpeas you load on each avocado toast. Thanks Rashmi!! I just love pomegranates and everything about them! They are such beauties, especially to use during the holidays! Thanks Reshana! You must try it...you'll love it. If you do send me a pic! Thanks Natalie! Oh yeah it's definitely a snack or meal all in one! I seriously devoured it all week long when I made it. It has a little bit of everything...and i just love everything about pomegranate seeds! Ah, well I like this loaded and amped up one much more! So fun! So jealous of your pomegranate source! ;) I love the idea of putting them on avocado toast. The sweet/savory combo with the chickpeas must be fantastic. Definitely trying! Thanks Tracy! That pomegranate tree is the best thing that's happened in our yard haha! This combo is to-die-for you'll love it! Let me know if you try! Thanks Veena! The roasted chickpeas really up this toast recipe and make it more filling! Not just salivating...straight up drooling! I love everything about this! Thank you Lisa!! I couldn't stop eating it! I usually have avocado toast with an egg for breakfast every day - delicious and the perfect blend of protein and healthy fats to keep me full until lunch. I'm going to try this version tomorrow to switch it up! Thanks for inspiring me! you'll love it! let me know if you try it! You have basically combined every single one of my toddler's favorite foods into one snack. Toast? Yes. Avocado? Absolutely. Roasted chickpeas? He can't get enough. Pomegranate seeds? Fun to squish. He will go nuts over this! Anjali, I saw your recipe on Pinterest, and I am so excited to try it! It has all my favorites: avocado, chickpeas, and pomegranate! Thanks Amy!! You'll love it...let me know if you try it out! I guarantee you'll be enjoying it all week long! Perfect for a quick healthy filling lunch for sure! I love avocado toast and have a recipe scheduled for tomorrow! Great minds think alike. :) This looks delicious! Just got back from travels and trying to catch up...heading over to check out your avocado toast recipe! Nothing better than avo toast! One of our go to's for sure. As are crispy chickpeas! Yum! Combine them with some arugula and pomegranates and it's SO delicious! Love the colors of everyone on this toast! Except for the pomegranate I made his recipe to the tee. Very bland and the chickpeas kept rolling off my sandwich. Won't make again. Sorry to hear that! 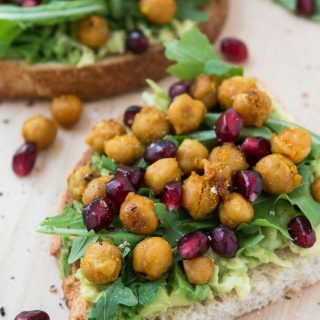 The combination of pomegranate, chickpeas, and avocado is the key to this toast recipe...the pomegranate adds a LOT of flavor to the curried chickpeas and is a main ingredient so it'll definitely be a difference in taste if you leave them out. And the chickpeas should have a lot of flavor...i Just made this myself last week again. Perhaps all the seasoning did not get mixed into the chickpeas prior to baking?